As President Donald Trump settles in at the White House, Apple chief Tim Cook this week visited Washington, D.C., to meet with Utah Sen. Orrin Hatch and take a dinner with Ivanka Trump and Jared Kushner. Source: Sen. Orrin Hatch via Twitter. Details of Friday's closed-door meeting are unknown, but in a statement provided to USA Today, Hatch said he and Cook discussed a number of topics ranging from the wider tech industry to America's economy. "During today's meeting with Apple CEO Tim Cook, we discussed ways to grow the economy and our tech industry, as well as his recent visit with me in Utah," the statement reads. "Given the issues I work on as chairman of the Senate Republican High-Tech Task Force, it's especially useful to listen to innovators like Tim." 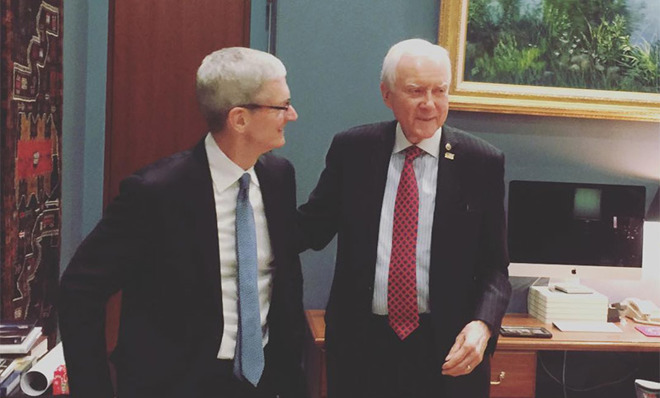 Hatch shared a photo of the meeting in a tweet earlier today. Cook is no stranger to Washington and has in the past visited Hatch to talk patent reform, net neutrality, immigration and other hot button topics impacting Silicon Valley. Most recently, Cook in October headlined Hatch's Utah Tech Tour, an event designed to spotlight the state's growing technology community. The Apple chief took part in a Q&A session in where audience members asked for advice on tech startups to the inevitable question about Apple's encryption row with the U.S. Department of Justice. Though some state actors and agencies cast it in a negative light, encryption is "inherently great," Cook said at the time, adding that society would not thrive without these digital safeguards. In a separate report, Politico says Cook and Apple VP of Environment, Policy and Social Initiatives Lisa Jackson were seen eating dinner with Ivanka Trump and her husband Jared Kushner. While Trump's daughter has no official cabinet role, Kushner was recently named a White House special advisor. Compared to his predecessor, late Apple cofounder Steve Jobs, Cook uses his position of power to actively push forward political initiatives. Most efforts revolve around Cook's passion for human rights and the environment, but Apple's actions during last year's DOJ imbroglio put the company front and center in an ongoing debate over encryption. Most recently, Cook was among a cadre of tech leaders who took part in then President-elect Trump's Tech Summit last month. While the wider tech industry faces potential issues with a Trump presidency, Apple has been singled out for its position on encryption, reliance on overseas manufacturing and tax practices. Trump attacked Apple during his campaign, saying the company should bring manufacturing jobs back to the U.S., and called for a boycott on Apple products over its refusal to cooperate with law enforcement authorities. Despite the harsh treatment, Cook showed up at Trump Tower in December. Explaining the decision to employees, Cook said it is better to engage government representatives on contentious issues, whether it be privacy and security, education or human rights.